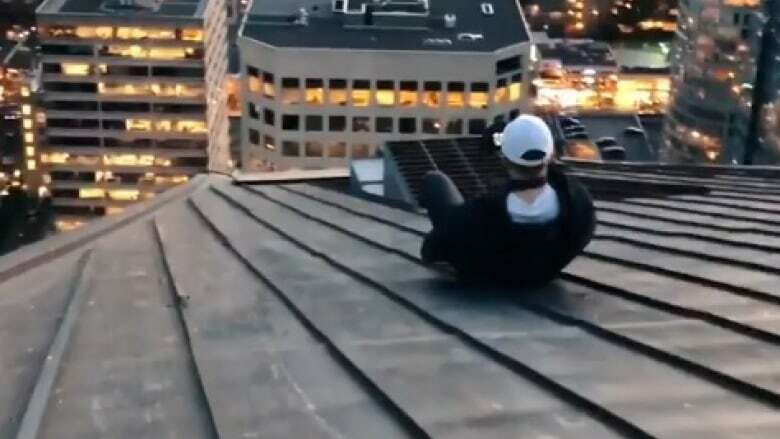 The video posted to Instagram in January and recently recirculated on Reddit appears to show a young man sliding down the roof of a 42-storey building. Police say this is dangerous and against the law. They want people to report it. Vancouver police are condemning a video that appears to show a man dangerously sliding down the roof of a downtown highrise. It's unclear when the video was recorded, but it was posted to Instagram in January and also posted on Reddit this week. On Friday, however, the Instagram post was removed from the site. Const. Jason Doucette says the practice could end in serious injury and criminal prosecution. "Rooftopping is very dangerous and often criminal in nature," he wrote in a statement. "Examples of the types of offences could be break and enter, mischief." The video appears to show a man sliding on a rooftop in the Coal Harbour neighbourhood. The building is managed by FirstService Residential but the agency has not yet responded to calls for comment on the video and questions about sliding taking place at the property. Meanwhile, police are asking anyone witnessing a criminal offence to contact them and say those considering undertaking rooftopping consider the harm they could not only cause themselves but others. "If one of these people slips and falls, a first responder has to put their safety at risk to rescue the rooftopper," wrote Doucette. In July 2017, two American men were charged with mischief after an attempt to climb the Lions Gate Bridge.